In last week’s post on how to get organized to move, we have already talked about decluttering your closet and the pots and pans in your kitchen. This is the sequel: Naturally there are several more item groups where a little purging can make a lot of sense before moving from one home into the next one. For many book lovers, the idea of getting rid of any amount of books might have little appeal. It is true, if you enjoy the comforts of your own private library, and if you consider your well-filled book cases part of what makes your home a real home, you might want to skip the following paragraph. However, for everyone else, here are some ideas for dealing with your books. A large amount of books can be heavy as well as bulky, so we are dedicating a whole blog post to the questions of what to do with them before you big move. One way to decrease the amount of books for your move is to exchanging the hard or softcover versions for electronic copies, i.e. audio or e-books. With electronic copies, you can easily carry around your entire “library” of books. We do understand that depending on the amount of books you would be converting, this could become a costly project. Still, for starters it would make sense to sort the titles of those you already possess both physically and electronically/digitally. 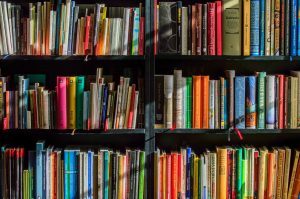 From Goodwill to library shops, from thrift stores to soldiers or prison inmates – this article contains several good ideas for donating your books to a charitable cause. There is, of course, also the option of asking around within your social circle: Maybe you have friends that are interested to take on some of your titles. If you are interested in even more information on how to get organized to move, make sure to check back in for next week’s blog post. There, we will address electronics, toys, and other items. In the meantime: Do you have special ideas for successful decluttering and move organization? Let us know!